The Kaweco Brass Sport Pen, is the first of the sport line of pens that Kaweco makes, that I have been interested in. As a rule I don’t consider plastic or resin a durable enough material for a pen that I would keep bouncing around in my pocket for years and years. Brass on the other hand is a nearly perfect material, it is durable, and takes a patina over time. It is dense and heavy which helps with a pen this small. It is nearly perfect for what I wanted, which was a pen that I could put in my pocket every day and not have to think about. When I need a pen, it will be ready for me. I have carried a wide variety of pens over the years, but the one area where they all seem to fall short is durability. They are either made of flimsy materials, or they are long and prone to get bent or otherwise messed up due to rough treatment. I am very happy with this pen, it seems to meet all of my requirements well. I have had this pen for about a month now, and have used it several times a day, it has never failed to start up and though I will often pause with the pen uncapped for several minutes at a stretch, it has yet to dry up on me while I was pondering. I chose the EF nib with some hesitation as I have read that some of the finer Kaweco nibs have misaligned tines, but I have examined this one very closely and it is cut very straight and clean. I am not convinced that it is a true EF, I would consider it more of an F, but I am not worried about it, I am happy with the line weight. This is a simple object, it is an enameled metal box will space for 12, 1/2pans of watercolor paint, and a tiny, tiny brush. Thats it. It has no buttons, no lights, and takes no batteries. It’s design hasn’t really changed much in decades, (other than the lid which seems to have only 2 mixing areas now, as opposed to the 4 areas that mine has) the design is perfect as it is, there is no ned to change it. I love this little box. There is a thumb ring that folds out on the bottom, so you can use it as a tiny little pallet, it has a lid that you mix your paint in, and a very small brush, (which I don’t use much since I use a waterbrush) this is good design and a mature object. There is no where else to go with this design, it is perfect, perfect, perfect. 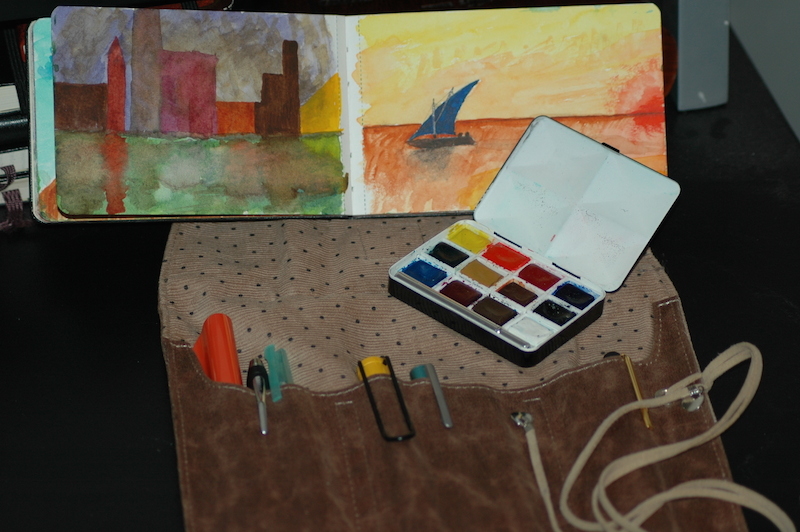 I love to use it in conjunction with a watercolor Moleskine, and a waterbrush, this is the art trifecta. A perfect set for creativity and inspiration. This is one of those items that I would replace without question if it was ever lost or broken.